How often do you see Cinema…. ~ this photo of James Anderson practicing before the 4th Investec series made me post this…. Before that do you remember ‘Chandramukhi’ – the Rajnikant starrer released in 2005 and do you remember who its music director was ? it was the official remake of the 1993 Malayalam film Manichithrathazhu, starring Mohanlal. Manichitrathazhu (The Ornate Lock) a Malayalam psychological thriller film was written by Madhu Muttam, directed by Fazil, and produced by Swargachitra Appachan. The film dealt with an unusual theme which was not common in Indian cinema but proceeded to become a high grosser at the box-office. It was Aaptamitra [in Kannada]; Chandramukhi [Telegu]; Bhool Bhulaiyaa [Hindi]; Rajmohol [Bengali]; Chandramukhi ke Hunkaar [Bhojpuri]; Der Geisterjäger (lit. The Ghost Hunters in German). The 4th test of the somewhat troubled Australian tour of England begins today. It is to be played at Chester-le-Street. In the 3rd test at Old Trafford England remained unbeaten for the 11th consecutive Test, while Australia failed to win for the seventh match in a row. The result also ensured the Ashes would remain in English possession. Australia appeared to have turned a significant corner, putting near enough to five days of staunch cricket together for the first time in recent memory, and England looked more than a little exhausted by their earlier efforts in the series ~ and rain came the saviour on the final day. There are already comments that this probably is the weakest Aussie line-up ever to have toured. Now this is no Cricket post ….. The first significant match played at Chester-le-Street was when Durham took on the touring New Zealanders in 1992, relatively very new considering the fact that some grounds have a century of existence and a couple have 100 matches played too. In 2003, the venue because the first new Test ground in England since 1902 when it staged a match against Zimbabwe. Reportedly, it’s a long walk from the train station for the spectators; the stands around three-quarters of the ground are fairly low, and offers a view of Lumley Castle which one can see in that Anderson photo. Chester-le-Street is a town in County Durham, England. Its history goes back to Roman times when it was called Concangis. County Durham is a ceremonial county and (smaller) unitary district in North East England. By some accounts the cricket ground has a capacity of around 12000 which is too low by Indian standards. 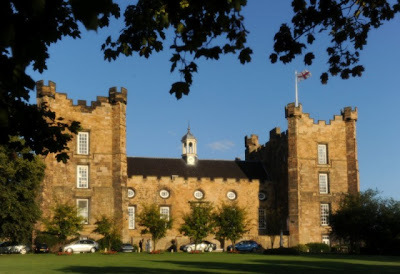 Lumley Castle is a 14th-century quadrangular castle, named for its original creator, Sir Ralph Lumley, who converted his family manor house into a castle in 1389 after returning from wars in Scotland. However, after being implicated in a plot to overthrow Henry IV he was imprisoned and ultimately executed, forfeiting his lands to the Earl of Somerset. In 1421 the ownership of the Castle reverted to Sir Ralph Lumley's grandson, Thomas. In 1976, management of the castle was handed over to No Ordinary Hotels (although the property is still in the possession of Lord Scarbrough), who had the castle turned into the 59-bedroomed hotel it is today. The castle is believed to one of the most haunted places in County Durham. Locals believe that the castle is haunted by the ghost of Lily Lumley, Ralph's wife, who was thrown down a well in the castle grounds by two priests for rejecting the Catholic faith. Knowing they would be in trouble, the priests told Sir Ralph that she left him to become a nun. Her ghost is said to float up from the well and haunts the castle. In 2000 and 2005 visiting cricketers staying at the castle claimed to have witnessed paranormal activity. Now the link is clear – Manichitrathazhu, Chandramukhi and more… the storyline was a thriller of a young couple arriving at an ancestral home haunted by a ghost of a girl who dies young without realizing her dreams. The girl and her lover both end up committing suicide and their spirits are locked in that ancestral house by an ornate lock. People fear the blood-thirsty spirit which gets on to the heroin who then has a split personality. The entry in to the mansion and the subsequent developments form part of the movie which gave Ranjikant reasons to celebrate after a lacklustre Baba. The music composer for Chandramukhi was ‘Vidyasagar’.